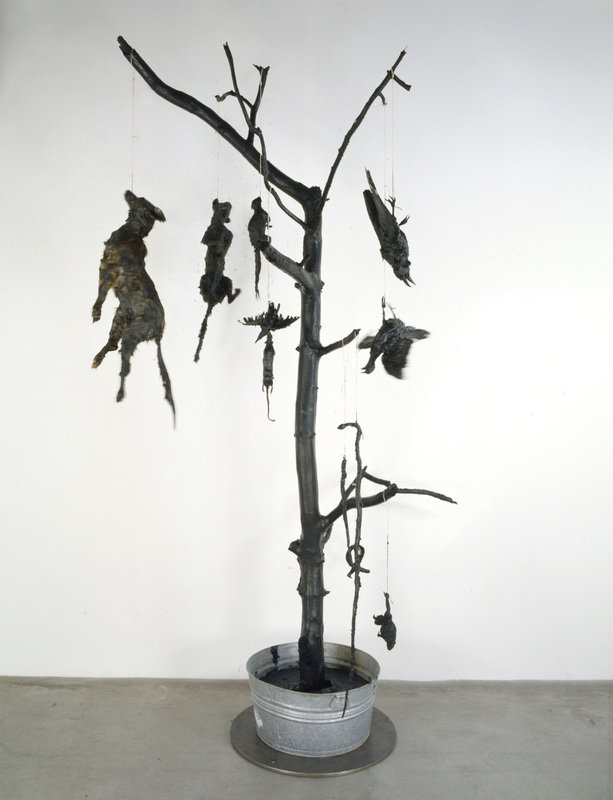 Covered with tar and hung from a dead tree branch "planted" in a galvanized metal bucket, an assortment of predators and vectors pay their penance in perpetuity both in the sculpture itself and in our culture: animals such as coyotes and rats are the frequent target of planned mass executions due to their perceived threat to public health and safety. Rounded up and killed for crimes no greater than following their natural survival instincts, these animals exist as outlaws forced to live on the margins of society. Killers Killed points to the somewhat arbitrarily assigned category shared by these animals, implicating humans as the most insidious predators of all. "Killers Killed." Take It or Leave It: Institution, Image, Ideology Digital Archive. Los Angeles: Hammer Museum, 2017. https://​hammer.ucla.edu/​take-it-or-leave-it/​art/​killers-killed/​.